Murray Rothbard nailed it in 1977. California's periodic water shortages, of which the current one seems particularly harsh, are a government creation. When the State controls a resource -- any resource -- shortages and gluts occur. This is because there is no market price system to signal directly to consumers how scarce the resource is versus how in-demand it is. The current shortage is no exception, and is actually due in large part to a government ruling in May 2007 intended to protect a species of fish. 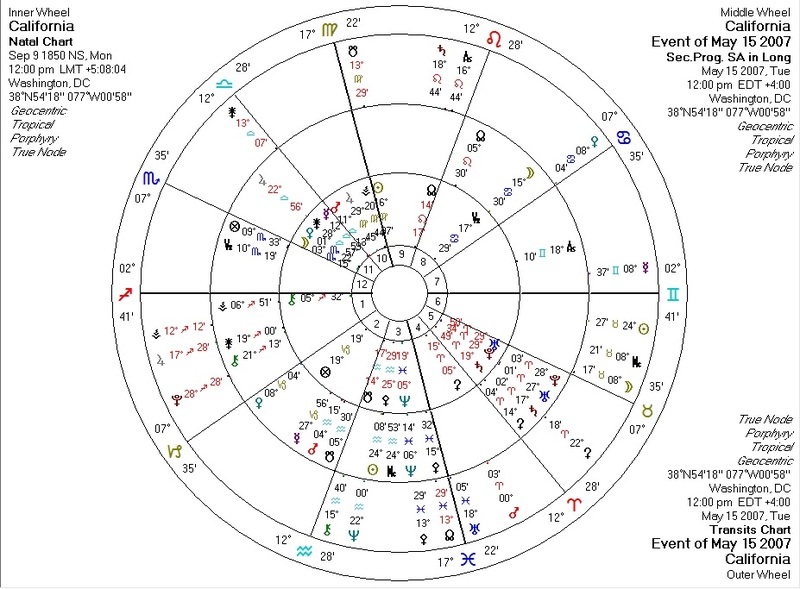 The date of the ruling isn't readily available, but California's transits and progressions for the middle of that month are interesting. That's Uranus, ruler of Aquarius (the "water-bearer") in Pisces (a "water sign") at the IC (home/land). Uranus is considered to be a "dry" planet, and here is tightly square Jupiter (both as an indicator of judges and also as an "effect multiplier" to Uranus). Hard Uranus-Jupiter aspects in the recent past have tended to correspond with mysterious die-offs of fish and birds around the world: perhaps due to outsized (Jupiter) freak electrical activity (Uranus)? While the North Node is conjunct Pallas (hinting that something may have been born around this time which may eventually have a strong libertarian character), Jupiter is square Pallas representing victory of ideology over ethics. A more "democratic" solution might have had farmers and environmentalists bidding against each other for use of the water. Living species have been coming in and out of being long before humans had the ability to drastically change the environment -- Mother Nature cares less about some of her children than we do in this regard. In the cases where the survival of a species seems to be entirely a human decision, one to be weighed against human well-being, perhaps the market should decide instead of a handful of invisible bureaucrats.